Pt I: A Comprehensive Guide to Building Apps with React.js. Pt III: Architecting React.js Apps with Flux. **Check out our courses. They’re the successor to this blog series. When you first start learning React, you’ll inevitably ask yourself “Should I learn Flux?”. You’ll then most likely look to Google for the source of that answer and after a bit of researching softly conclude that, yes you should. However, I wish that wasn’t always the answer. Flux is great. Flux does a really good job at what it’s designed to do. I use Flux. A lot of people use Flux. But you don’t have to use Flux with React. In fact, I would suggest that you don’t even look at Flux until you really understand the pain point that it’s trying to solve. Too many people jump into React then jump straight to Flux because they think they have to and are left disappointed with React because Flux is a bit, complex. Don’t let the complexity of Flux ruin the simplicity of React. So, a better question than “Should I learn Flux?” is “Should I use Flux for this particular project?” and if yes, then learn it. The entire reasoning behind Flux is making data changes in your app easy to reason about. In its most simple form, Flux removes the burden of having a component manage its own state and moves that data to a central location called a Store where multiple components can now share that data. Then, everything in that Store’s purpose is to, in one way or another, assist in the modification or preservation of the data. The benefit of this is that if the data in the Store changes, you know exactly what triggered the change because the Store is the only place in your app with the ability to modify the data. Notice how Flux revolves around the fact that your application has data and that data needs to be kept up to date in an effective manner. If your app doesn’t have and or care about dynamic data, Flux might not be the best choice. Flux excels in respect to data management, but will feel unnecessary if you don’t have any data to manage. So now that you’re aware of the necessity of your app to have data in order for Flux to be beneficial, let’s talk about the flow of a Flux app. Because, again, the whole idea of a Flux app is to make your data changes easy to reason about, Flux embraces a one way data flow architecture. So what we’ll do in this tutorial is we’ll walk through every part of the Flux architecture until we have a solid grasp of each concept. Above is a Flux diagram I made that I wish existed when I was learning Flux. It won’t make a ton of sense now, but as you read through the different parts of the Flux architecture my hope is that you’ll reference this diagram and it will start clicking for you. If you’ve read any of my tutorials before, you know I’m a huge fan of trying to break things down into their most easy to understand form. With Flux, I can honestly say this was a bit difficult. If something doesn’t make sense, keep reading and then re-read and I’m confident it will eventually click. Let’s start off with our components. Remember, one of the main points of Flux is to take the storage of the data out of the component and put it in a more central location (Store). Because of that, our components will look exactly the same except, as you probably guessed, we’ll be calling out to our Actions to add data and Stores to fetch data. For the sake of having code snippets that demonstrate the principles I talk about, let’s pretend we’re building a basic Todo List app. I’ll obviously leave a lot of parts out, but I’ll include the parts that demonstrate the specific Flux principle. Let’s break down this component. First thing you’ll notice is the list property on the object which is being returned from getIntiailState doesn’t have a value of an empty array but its value is instead whatever is being returned from todoStore.getList(). Remember the reason for this is because we’re taking the data out of the component and putting it into the Store. We’ll cover more about the Store side of things later in this tutorial. Next, you’ll notice the componentDidMount and componentWillUnmount methods. Each of those are calling methods on the todoStore which seem to be adding and removing an event listener. Head back up to the diagram for a second and reread the “Views/Component” section. Because we’re relying on the Store to house our data, we’ll need to make sure that whenever the data in the Store changes, our component knows about that and will update its own state. We accomplish this by passing the store a method (_onChange) which will refetch the data from the store and update the components state. Now, whenever the Store changes its data, it can invoke the callback function we initially passed it when the component mounted (_onChange) which will make sure the component keeps its data up to date with what’s in the store. 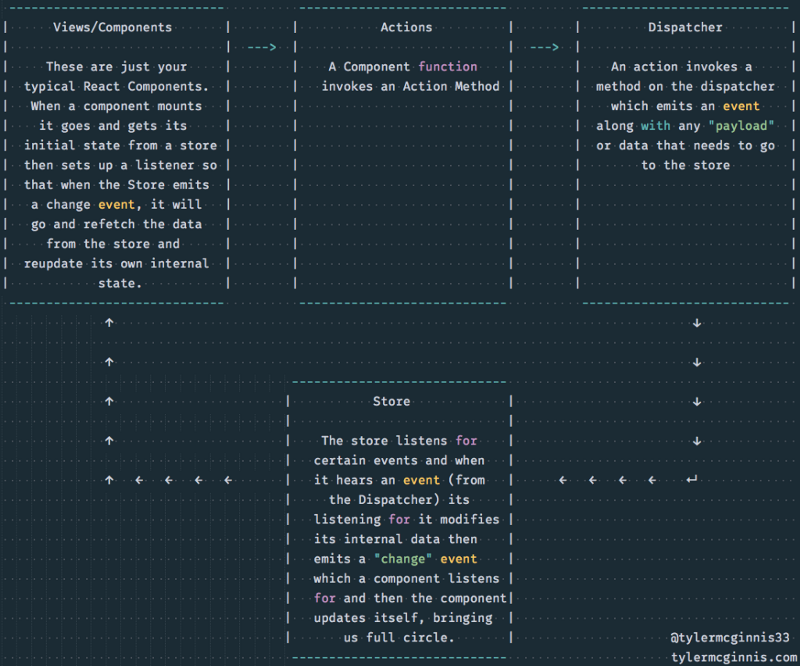 The addChangeListener piece is what’s tying the store back into the component. The last thing to notice is that every time a user event occurs, whether it’s adding a new item to the todo list (handleAddItem) or removing an item from the list (handleRemoveItem), we’re invoking a method on our todoActions rather than using *setState. *Again, this is because our main source of truth for our data is the store, and as the diagram points out, we first need go through our actions in order to eventually update the data in the store. Let’s now take a look at our actions, or the second phase of our Flux diagram. Referring back to the diagram, the Dispatcher is what is going to emit a certain event. Notice the way we keep track of these events is through a constants file. Because we need to emit a specific type of event, and also listen for that exact same type of event, a constants object makes perfect sense. Notice literally all this constants object is is a mirrored key value pair. Whose keys/values are whatever the specific event is we’re emitting/listening for. Back to our actions, since our Dispatcher is the one actually emitting an event, our Actions object can be thought of as essentially just prepping an object before it’s dispatched. Notice in our addItem method the actionType is appConstants.addItem and the data is just the specific item we’re adding. These keys/values will eventually make themselves to our store where we can not only listen for that specific event (addItem) but also grab the data off of that payload once it gets to the store. Now we’ve arrived at the 3rd part of our diagram, the Dispatcher. You can think of the Dispatcher as the hub of your app. Every time you want to change the data that lives in a store, you must go through the Dispatcher. You probably noticed there’s really not much going on here. That’s because, there really doesn’t need to be much going on. The whole point of the dispatcher again is to dispatch certain events. There are plenty of libraries that do this, but the recommended one is the one we’re using in the code above. It also happens to be the one facebook uses as well. We require the flux module, then create a new instance of the Dispatcher on that module, then set a method on it that we’ll invoke from any actions in our app. The reason we’re using VIEWACTION *as the source of our dispatch is because you could also be using SERVERACTION if that action was coming from the server. The only other thing is to pass along the action which is passed in when handleAction is invoked (and contains the *actionType as well as the data). What’s interesting about our Dispatcher is that most people don’t really mention that you’ll use the same dispatcher in all your stores as well in order to register callbacks which will be invoked when certain Dispatches are dispatched. It’s a little weird at first, but you can think of the Dispatcher as kind of a bridge. In the main Dispatcher.js file is where you set up your handleAction method which will dispatch the actual event, but you also need to make it so your stores actually listen to those events. So what’s interesting, and kind of confusing at first, is inside your store you’ll require the Dispatcher which you exported from your main Dispatcher file in order to register some callbacks that will be invoked whenever the Dispatcher dispatches then hears those certain dispatches. We’ll see that in the next section on Stores. I realize that got super wordy but stick with me. The paragraph above will make more sense after reading this next section. The store, where the magic happens. You can think of a Store as having four parts. Second: Setter methods. Remember, the whole point of Flux is to make your data changes easy to reason about. These setter methods will be the only interface for manipulating the data of our store (which we made in the first step above). Third: The Store itself, which is really just a collection of getter functions in order to access the data in the first step along with a few emitter/change listener helpers. Another idea of Flux that might throw you at first is Getters vs Setters. Remember, we only want to be able to manipulate the data from our setter functions (which we made in the second step above). However, we want to be able to GET the data whenever we like through our Getter functions defined in this step. To accomplish this, we’ll make the setter functions “private” to our Store file while we’ll export the actual Store (this step, or the collection of Getter methods) so that we can require the Store in other files and invoke those getter methods in order to get the data. In other words, this step is going to be global, while the other steps will be “private”. A few things to note about the actual code above. Notice, as mentioned, we have our getList method which just returns us the list. If you remember back to the component we built earlier, you’ll notice in getInitialState we’re invoking* todoStore.getList() *and setting the result to the list property on our state. This getList method in the Store above is the interface for getting the data out of the store. We also have the addChangeListener and removeChangeListener *methods. Again if you remember back to our component we built earlier, when our component mounted, we passed in *_.onChange which just used setState to invoke todoStore.getList() in order to refetch the data. Well, the cb parameter we’re passing to addChangeListener and removeChangeListener is that _.onChange function. So now, whenever a CHANGE_EVENT (or “CHANGE”) event is emitted, React will invoke _.onChange which will update the state of the component. The last thing to discuss about the todoStore itself above is the use of objectAssign with EventEmitter. All objectAssign allows you to do is extend/combine objects together in order to make “super objects” if you will. By super objects, I mean objects whose keys/values are a collection of keys/values from different objects. We pass objectAssign a target, or an empty object first. This empty object is what the next two parameters are going to add their properties to. We then pass it EventEmitter.prototype. Now our empty object will get all of the properties that are on the EventEmitter’s prototype object. This will give our store the ability to do things like .on() and .emit(). The last argument is another object whose properties will be added to the empty object. So when everything is complete, the object being returned from objectAssign is an object which has all of properties of EventEmitter’s prototype as well as adChangeListener, removeChangeListener, and getList. Fourth: We need to use our Dispatcher to listen for certain events and when we hear those events, invoke the setter functions above (in the second step). So on our Switch statement, we’ll be checking the actionType in order to know which action was emitted. Based on that actionType, we’ll know exactly what setter function (which we created in step 2 above) to invoke in order to modify the data. Once we invoke our setter function, we will then emit a change event, then, because in our addChangeListener method in our todoStore we set up the .on() event handler, whenever it hears the change event, it will invoke the callback function which was passed to it which is _onChange from our original component. Here’s the full code for the todoStore.js file. Let’s walk step by step through the whole process now. Our todoStore is created, creating a place where our data lives, some setter functions, a todoStore object with a getList method a addChangeListener and removeChangeListener function, and we register our callbacks with the Dispatcher. When our component mounts, we pass _.onChange to todoStore.addChangeListener which makes it so whenever the Store hears the “CHANGE” event, it will run _.onChange which will refetch the data from the store using todoStore.getList() and update its own state with the data returned from getList(). A user clicks “Submit” wanting to add a new item to their todo list which invokes a method on the component which we’ll call handleAddItem. handleAddItem runs and invokes the todoActions.addItem method passing it the new item to add. The addItem method on our todoActions object invokes AppDispatcher.handleAction passing it an object with the actionType of appConstants.ADD_ITEM and the data of the original todo item. When AppDispatcher.handleAction invokes, it emits appConstants.ADD_ITEM, because of step 1, the callback we passed to *AppDispatcher.register *in our Store is invoked, the switch statement catches the *appConstants.ADD_ITEM *conditional and then *addItem *is invoked which pushes the new item onto our data in the Store. _onChange runs which uses todoStore.getList() in order to update its own internal state and now we’ve gone full circle. That process in code will look like this. Now, that might seem like a rather large and unnecessary process to take. That’s a fair judgement. But remember what Flux is designed to do. It’s not meant for small apps with little data but instead meant to be implemented with large apps with complex and ever changing data.